There are few things more frustrating for parents than trying to soothe a crying baby and finding no success. Most babies experience bouts of crying and for some, these episodes go far beyond typical fussiness. Colic is usually described as crying that continues for at least three hours per day, three or more days per week. While All Babies Cry in order to express themselves, colicky babies are not calmed once their needs for food, a clean nappy, sleep, or comforting are met. The inability to decipher just what the baby needs can be quite unsettling for stressed out parents. 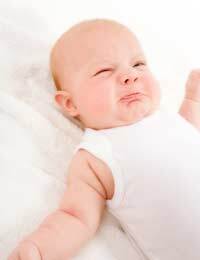 Colic usually begins somewhere between the third and sixth week of life and goes away on its own by the time that the baby is three months old. Excessive crying in babies over three months old should be checked out by a paediatrician since there may be an underlying health problem. Doctors have no conclusive answers to the possible cause of colic, but there have been many theories throughout the years. It was once believed that colic was symptomatic of an allergy to cow's milk, typically found in commercially prepared Baby Formula. This notion was dismissed since breastfed babies can be colicky, just like their formula fed peers. There are some studies that suggest a possible link between a nursing mother's diet and the amount of time that her baby spends crying, but this has yet to be proven. Some nursing mothers find that when they eliminate certain foods, such as dairy, wheat, soy, eggs, fish, and nuts, their babies seem to cry less. Other nursing mothers eat these foods and their babies show no signs of being colicky. In any case, this cannot be the answer to all cases of colic since not all babies who have colic are breastfed. A generation ago, parents of colicky babies were instructed to administer gas drops since many babies with colic are also gassy. We now know, however, that the gas that colicky babies suffer results from swallowing air while they are crying, rather than being the core cause of the crying. Finally, some experts once theorised that colic was due to babies sensing the anxiety of their parents, but there is no evidence to support this notion. Since many types of discomfort will cause babies to cry, it is important to try to rule out indigestion or other possible causes of distress. Formula fed babies may be having trouble digesting a particular formula, but parents often find that by switching brands or trying a soy based product, their babies cry significantly less. Also, colic does not cause fever, vomiting or diarrhoea, so if your baby experiences such symptoms, be sure to call the GP. Walking the baby, especially when held facing outward, seems to work for some babies, while rocking or placing the baby in a swing may have a claming effect, at least temporarily. Some colicky babies enjoy being placed on their tummies and having their backs gently massaged. Baby massage is increasing in popularity among parents of all babies and many parents find that a soothing massage helps their babies to sleep soundly. Soft music can help, as can a ride in the car. It is important to make every effort to console a colicky baby and it may take a bit of experimentation before settling on a method that works. Caring for a new baby is joyful, but it can also be very stressful, especially for parents of colicky babies. It is important for exhausted parents to realise that their baby's colic is not their fault and they should not feel guilty about their inability to calm their babies. Even experienced parents and baby experts cannot always find the cause of a baby's excessive crying. It can help to know that colic will pass and within a few months the baby will be much calmer and easier to soothe. In the meantime, parents should give themselves permission to take some time away from their babies, leaving them with a trusted caregiver. When no outside help is available, it is acceptable to simply lay a colicky baby in the cot for a short while in order to give parents a break. Often, getting a bit of a breather is all that is needed to calm the frayed nerves of stressed parents. For help and advice on Establishing A Feeding Routine, read our article on this site.